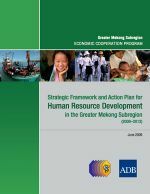 The Greater Mekong Subregion (GMS) Economic Cooperation Program is aimed at promoting closer economic ties and cooperation and improving the quality of life in the subregion by emphasizing the "3 Cs": connectivity, competitiveness, and community. Human resource development (HRD), with its potential to enhance competitiveness, increase returns on physical connectivity, and build a sense of community, is one of the five strategic areas of cooperation under the program. HRD covers the four subsectors of education and skills development, health, labor and migration, and social development. This document sets out the regional HRD challenges and opportunities for cooperation and outlines the first GMS HRD Strategic Framework and Action Plan. The Action Plan 2009-2012 reflects the priorities presented in the Strategic Framework with a clear focus on regional HRD issues that require regional solutions.